Should Young Children Learn About Life's Meaning? 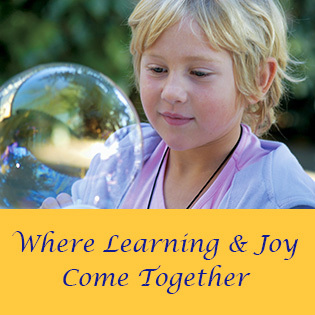 Q: Living Wisdom School nurtures children’s sense of life’s joyous possibilities. How do you counteract the widespread belief today that life is meaningless? Helen: In our school, we feel that the relationship between child and teacher needs to be based on an authentic commitment to live life consciously, in alignment with high principles. We have teachers who are “heart people.” They teach from the heart, and it can be very effective, because if the children sense that your heart is closed or judgmental, they’ll shut you out. True learning begins when you encourage children to have an open heart that is willing to embrace ever-wider realities. You can best do that when they feel safe, and children feel safe when they’re supported, and when they’re given a strong, clear sense of life’s positive meaning. Our philosophy is so central to the children’s experience in our classrooms that it’s impossible to talk about how we approach the “crisis of meaning” without mentioning it. I’m thinking of two separate examples that happened in the last two days. A little boy in our school had cousins visiting from India. One of the cousins spent a day in our first-grade class, and the other cousin visited my class. So they spent their vacation in school with us, because they couldn’t believe the feeling of it. They told their mother, “The teachers are kind and the children are friendly.” And it’s not simply that the children in our school are taught good manners, or that they memorize a set of rules that they have to follow for getting along. It’s the result of something that runs much deeper in our school, and that supports the children by giving them a sense of meaning. It’s a culture that’s embedded in the school, based on our deep commitment to living life consciously. Let me explain. I’m tempted to say that it’s all about joy. And, yes, that’s part of it, because children have tremendous energy and a natural wakefulness and presence in the moment. And if we can guide that enthusiasm rightly, they’ll experience a deep sense of security and happiness. So the children’s natural energy and awareness is something we treasure and nurture in them, because it’s the foundation for helping them find a lifelong sense of meaning, including a deep love of learning. But we also find that when we nurture children’s natural ability to be present in the moment, tremendous learning can occur, so long as you’re presenting the curriculum in a way that brings out their natural eagerness and enthusiasm. It means that as teachers we aren’t just imparting a fixed curriculum, plodding through the book. We’re noticing how each child is responding – where their awareness is at each moment, and how we can guide them through the curriculum in a way that builds on their native enthusiasm. Naturally, the teacher is the center of the energy in the classroom. And this is especially important for the younger children. Because the teacher notices what’s going on in their lives and their hearts and minds, then with a little guidance you can help them feel very, very happy and secure in the classroom, and they can go happily from activity to activity. The girl was eleven, and she was literally hiding behind her mother when we met her, the way a kindergartner might behave on the first day of school. But after five minutes she had completely forgotten that her mother was there, because the students understood how to open their hearts, and they drew her in. It was a huge transformation for her. And that’s the power of a culture that celebrates the positives and makes people feel safe and included. Q: You’re creating a special atmosphere in the classroom? Helen: I wouldn’t exactly call it an atmosphere, which suggests a mood that can change from one day to the next. It’s a culture that is deeply engrained in how we think and feel and behave. And it expresses in many ways. And because it’s very attractive to the kids, they internalize and duplicate it, so it grows. Q: Creating a culture of meaning, purpose, and hope for the children – what does that require? Helen: Of course, there’s a large amount of direct classroom instruction. But in an intimate setting such as ours, and with our favorable teacher-student ratio, there’s a tremendous amount of individualization. Q: Is it based on noticing each child’s unique needs? Helen: Yes. In our school, it would be impossible not to. Gary McSweeney, our middle school teacher, and I often laugh, because we both went to Catholic schools where there were fifty children in a classroom, ten in a row, all lined up with the nun in front. And, well, it wasn’t all that bad at my school. But certainly there was no individualization, because it just wasn’t possible. But it would be almost impossible in our school not to individualize the curriculum, since we’re so accessible to the children, and because we’re always relating to each other one-on-one. 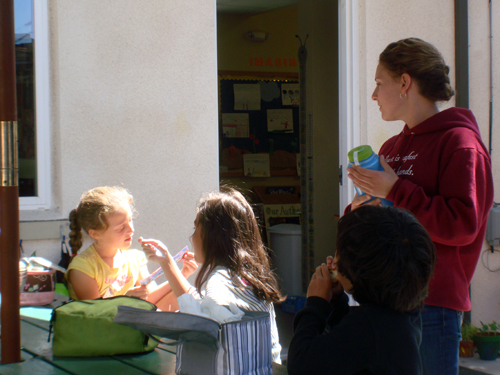 Teacher Erica Glazzard at recess with her first-graders, Living Wisdom School, Palo Alto, California. All of the teachers are trained to help children understand basic laws of successful living, for example, that expansive attitudes such as kindness bring us happiness, but hatred and other contractive attitudes always result in unhappiness. I said, “Of course, it’s true.” (laughs) So, you see, it’s a question of where you’re coming from. Are you only focused on ensuring that the children complete the state-mandated curriculum? Or are you concerned wholly and entirely with the success of each individual child? Q: In her book, The Argument Culture, Barbara Tannen describes how in our culture we put every issue, whether it’s politics, religion, or education, in the context of an argument. For every pro, there has to be a con! And if you don’t bring out the negative and dwell on it in loving detail, people are programmed to think that you’re hiding something. Helen: They think you’re “looking at life through rose-colored glasses.” But it’s a wholly false view to think that the negative defines us. 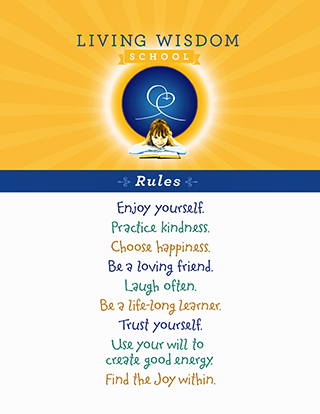 Certainly, there’s negativity in the world, but our own happiness comes by expanding the positive aspects of our nature – and that’s a firmly engrained feature of our school’s culture. So we talked about it. We talked about the life of the spirit, and how when you’re aware of spirit, the physical plane that we’re so familiar with is clearly seen to be less real, and that’s why the chant says that death is a dream. Because, as the saints of all times and cultures have told us, in our soul nature we never die. I told them the story of Saint Francis, and how he was on his deathbed and singing joyously because he was so filled with God’s bliss. One of Francis’ fellow monks, Brother Elias, was concerned with the proprieties – he felt that a person should be very sad and grave when they die. So he scolded Francis. (laughs) And Francis said, “Oh, Brother Elias, but everything is so beautiful!” – even though he was blind and couldn’t actually see. I said, “Absolutely not!” And we talked about the human heart, and how our feelings, too, are very real to us. And the point is, children will demand that degree of thoroughness when you teach them. And if you don’t give it to them, they’ll feel poorly served and they’ll tune out. In our classrooms, we make time to address these questions and not gloss over them because we’re hell-bent on keeping up with some fixed-in-stone government-mandated curriculum schedule. So we make a point of pursuing those conversations. And it can be challenging to explain to parents and educators why it’s so terribly important. But it comes down to our basic philosophy, which says that if you can support and engage the whole child in the learning process, heart and soul and mind, you can create tremendous enthusiasm for learning. And we’ve found that being authentic in this way contributes tremendously to the children’s academic success, which is naturally a major concern of our parents. Q: Reading the latest news about high school students who’ve become alienated and shot up their schools, one suspects that their rose-colored glasses have been ripped away. They weren’t taught to nurture their dreams and deal with life’s big questions. Helen: A classroom is as complex as the most complex relationship, multiplied by however many kids there are in the class. And because we aren’t simply “delivering a curriculum,” we’re always addressing a very individual person. And there absolutely has to be a rapport that’s carefully developed between the teacher and the child. And when you consider that there are many individual learning styles, and learning disabilities, and differences in temperament and intelligence, you can see that it’s a multi-layered process. The science of teaching is about knowing how to explain the various components of knowledge. But the art of teaching is about knowing how to do it in a very individual, detailed, and creatively choreographed way. If a teacher with little experience were to walk into one of our classrooms, they wouldn’t understand what they were seeing. I walked into a classroom yesterday morning and found a little girl with tears streaming down her face. She tends to cry a lot, so you don’t always want to take it too seriously, but she was upset because she’d gotten braces and they were hurting her. Also, somebody had put yogurt in her lunch, and she hates yogurt, so she was mourning that she didn’t have a good lunch. So she was really crying, and I took one look at her, and I knew that the proper way to help her was to acknowledge her feelings but not get involved in a way that would encourage her to fall deeper into negativity. The tears stopped instantly, and for the rest of the day she was all right. But do you know how much time and energy went into that simple interaction with the student? There were all of the many, many times I had to figure out why she tended to do such-and-such, and why so-and-so worked for her, and so on. And that’s how we develop a deeper intuitive approach to doing what’s will help each child get free from negativity and find a positive sense of engagement and meaning. It’s very, very complex, and I happened to hit the nail on the head that day. But, some days, you won’t find the “nail” right away because you haven’t known the student for long, and you don’t yet know how to work with them. Q: You’re dealing with the children as whole people and not just brains to be filled with facts? Helen: Oh, yes. They’re just as much people as we are, but they aren’t able to hide their feelings as well as adults can. So their feelings tend to be laid out there for you to look at, and then you can figure out how to help them. Q: Does related to the children individually help them avoid becoming disenchanted? That’s our culture. It isn’t as if the children in our school are saints. They’re normal kids, and they do get into it with one another. But because our culture is so well-defined and we’re all very clear about our values, these things are addressed immediately, as soon as they happen. If a child says something sarcastic to another child, we don’t dismiss it as a small thing to be brushed aside. “Get over it, Johnny!” We consider it an opportunity for both children to learn: the one child to learn to be more kind, the other perhaps to learn to assert himself. Q: Are these some of the small things that nurture a child from inside, so that he or she doesn’t feel isolated or lonely? Helen: Yes. There’s a sense of family that extends from the kernel of the classroom out to the entire school. It doesn’t stop at the classroom door – it plays out on the playground, and between the children and the teachers outside the classroom. Our children feel comfortable with us. They approach us, not as peers, because there’s a definite level of respect, but they are not uneasy around us. They aren’t put off by our authority or by our roles, because they have a good sense of themselves, and they know that we have their interests at heart. When the children feel good about themselves, and they feel that the teachers are accessible, you have a situation where almost anything can be worked out. But if there’s a group of kids that feel closed off, alienated and marginalized, that’s where you get the problems with depression, rejection, and meaningless. Q: ABCNEWS.com on April 1, 2001 reported a nationwide survey of more than 15,000 teenagers conducted by the California-based Institute of Ethics. Of those teenagers, 21 percent of the high-school boys and 15 percent of the middle-school boys had taken a weapon to school at least once in the past year. Sixty percent of the high school boys and 31 percent of the middle-school boys said they could get a gun if they wanted one. And 16 percent of the high school students admitted to having been drunk at school. It’s amazing, the number of kids who have violence in their backgrounds, and it seems the kids who end up acting-out and shooting up their schools are just the tip of the iceberg. There’s a huge consciousness of violence in the schools. Helen: There’s also a culture of exclusion, and it’s at the heart of the problem. In middle and high schools, belonging to an in-group is assumed to be important, and no one is combating this false consciousness. But it’s tremendously harmful to children, to have all this fear and anxiety around superficial things like status, and whether you’re a jock or a geek or a rich kid or a druggie. Only in a culture where there’s a generosity of heart can children bloom. And you’re extremely unlikely to find it in any kind of structure that is hierarchical and compartmentalized. Someone told me they’re creating state and federal grants and funds to combat bullies in school. He said the governor of Colorado, acting through the state department of education, has outlawed the game of tag. Helen: Really, the solutions will never come by legislating them, or thinking about them in lofty isolation. Because they’re a matter of the heart. In our school, we assume that every child is perfect in his or her soul, and that the children need our help to manifest that perfection in the way their individual soul wants to. And that kind of progress isn’t something you can measure with numbers. But if you can do it, the rewards are great. When you nurture children individually, you create human racehorses who’ll be confident and competent in academics, relationships, and life. We look for the beauty of the individual child, even the most difficult. We’re with them constantly, so we’re able to see the glimmers of light behind the mask. You know it’s there, and it’s a question of bringing it out. Q: It seems you have a unified understanding of what children should get out of school. If there’s a keynote of the school, what would you say it is? Now this is a highly practical statement, because it’s very easy to verify it in our lives. We all know how it feels to choose to be happy and to treat others with kindness. It’s a simple, practical principle that the wise people of all ages have taught. But they never said it would be easy! We’re very real in the way we guide the students. Maybe things aren’t going well in your life all the time. So you have to choose to come at your life from a point of inner joy. That’s the essence of our teachings. Again, it’s working with the human reality and the inner reality both, because they aren’t separate. “We are our aspirations,” but we need to build our dreams on a realistic foundation. A child can feel overwhelmed by a mood, but they’ll be lifted by the other students who are managing to stay centered in those attitudes of kindness, compassion, and happiness that are a central part of the school culture. We’ve had a cascade of kids who’ve gotten braces recently, complete with the full range of side effects, from braces that cut the gums, to headaches, to being unable to think, and not wanting to be at school. They want to be good, but they don’t feel well. And do you know what the class does? The class prays for everybody who has braces. In the morning we do healing prayers for them, and you can honestly see the impact it has on those kids. Even if it doesn’t take the pain away, they have this incredibly powerful sense of friendship and support from their classmates, and it transforms their experience. The other day, a little boy said to me, “Helen, can we say a prayer for my sister Heather? She’s coming in on the plane.” So we stopped in the middle of the lesson and we said a prayer, because it was okay. It’s just one little thing, but when you multiply it by all the other little positive things that happen, it adds up. A child can’t figure out how to double-space on the computer, and someone will walk over and say, “I know how.” They don’t have to ask the teacher, because they know it’s okay to help each other. Q: Helping each other with schoolwork is encouraged and accepted? Helen: It’s accepted, and we give them freedom to act it out. When everybody’s operating from that point of origin – “I want to choose happiness, I want to be kind.” – nobody has to be in control in a rigid way that stifles their individual differences.